A Swiss Roll with just raspberry jam is a wonderful thing, but the addition of raspberries and whipped cream takes it right over the top. It's one of those desserts that never fails to impress, looking much more difficult than it is. The problem I had with the first one I made years ago was with the cake itself. Baking a regular cake in a jelly roll pan is not the way to go. It needs to be a proper sponge cake, and I prefer the kind made with separated eggs. 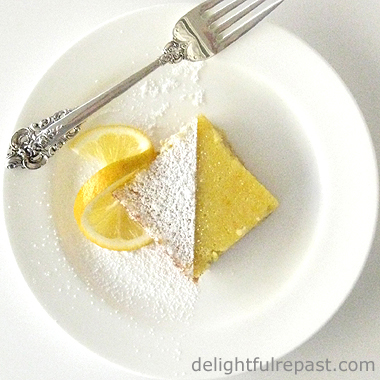 I used to make the sponge cake with four eggs until I had occasion to try one made with five. When I took it out of the oven, I thought it looked far too eggy, even omelette-like. So when I had my first slice of the finished product, I was surprised at the perfect texture. Though all recipes for a Swiss Roll seem to call for pre-rolling the cake while it is warm and then unrolling it, filling it and rolling it up again, I've found that's not necessary. I don't do it with my recipe. I just roll it once, at a carefully timed moment, and that's that. I'm going to say that again: I just roll it once! Update 11/09/17: Try my naturally gluten-free Chocolate-Hazelnut Roulade. Beating the yolks and whites separately makes a more flexible sponge that is less inclined to crack. Not overbaking, baking just until set but still springy to the touch. Rolling it while it is still warm enough to be pliable, but not warm enough to melt the whipped cream. 1 Preheat oven to 375F/190C/Gas5. Line a 15x10x1-inch (38x25x2.5 cm) rimmed baking sheet (jelly roll pan or Swiss roll tin) with a piece of parchment with an extra 2 inches on each end for easy removal. Spray parchment and sides of pan with cooking spray. In small bowl, sift together flour, cornstarch and half the salt. 2 In bowl of stand mixer fitted with whisk, beat the egg whites, cream of tartar and half the salt on low speed until foamy (might have to use a spoon to mash up clump of cream of tartar). Increase speed to medium and continue beating until trails become visible and bubbles are very small, about 2 to 3 minutes. 3 Increase speed to medium-high and gradually add in 1/3 cup of sugar, about a tablespoon at a time, taking about 2 to 3 minutes. Increase speed a bit and whip until meringue is glossy and medium* peaks form when the whisk is lifted, about 4 to 5 minutes. * Must beat past soft peaks, but not all the way to stiff peaks. 4 In 2- to 2.5-quart mixing bowl, using an electric hand mixer, beat the egg yolks with remaining 1/3 cup sugar until pale yellow and fluffy; this takes a few minutes. Add the cream, melted butter and vanilla extract; mix until combined. 5 Sift the flour-cornstarch over the egg yolk mixture. With silicone spatula, gently fold the flour in. Then gently fold in the stiff egg whites, a third at a time, being careful not to deflate them. 6 Gently scrape the batter into the prepared jelly roll pan and quickly spread it evenly. Place a towel (or pair of potholders) on the countertop and drop the pan onto it from a height of about 6 inches two or three times to get out the large air bubbles that would make holes in the cake. 7 Bake for 8 to 10 minutes, just until done. A toothpick inserted in the center should come out clean; the cake should spring back when pressed gently in the center. 8 While the cake is baking, whip the cream, powdered sugar and vanilla extract until it is quite stiff. You need to have your filling ingredients ready so that you're ready to proceed the moment the cake is cooled sufficiently but not completely. 9 Use a knife to loosen the sides of the cake from the pan. Using the two ends of parchment paper, lift the cake out of the pan onto a wire rack to cool for a bit. Melt the jam. 10 When the cake is still warm enough to be pliable but not warm enough to melt the whipped cream, take the cake off the wire rack and place it paper-side down on the counter with a short end in front of you. Spread the jam evenly over the cake, leaving about a 1.5-inch border at the far end uncovered. Spread the whipped cream evenly over the jam. Distribute the berries evenly over the whipped cream. 11 Start rolling the cake at the end nearest you, peeling away the parchment as you go. Wrap the rolled cake in plastic wrap, place on tray seam-side down and refrigerate for at least 2 hours or up to 1 day. Bringing it out of the refrigerator 15 to 30 minutes before serving makes the texture of the cake superb. 12 When ready to serve, trim the ends of the roll for a tidier look (and a cook's treat! ), place it on an attractive platter, dust with powdered sugar, garnish as you like. Ellen, thank you so much - you just made my day! Thank you, Joy! I hope you'll give this one a try because I think my method makes it a lot simpler. Katherine, thanks ever so! Social media shares are much appreciated! Oh yummy! I do love jelly rolls with whipped cream and fruit in them - does that make them Swiss rolls instead? What a wonderful dessert - fit for a queen for sure! Thanks for sharing Jean. You have so many great recipes! Thanks, Lorrie! And I don't know, that might be the case, or it might just be a regional thing - I think such cakes are always called Swiss rolls in England, for example. Now you've got me curious! There you are! And here I am with a severe conflict. I think I can trace my aversion to most (not moist) cakes to having tasted a sponge once when I was much younger – say, 50 or 60 years old. Ergo, sponge cake produces a catatonic state in my taste buds. When you add the fact that I don’t care for powdered sugar (go figure), there is not much chance for recipe redemption. But…BUT, I say, then you put in the raspberries and whip cream. So it would all come down to how much of each is in the final offering, and from the photo, I can see it would work. As long as each forkful includes raspberries and cream, I can beat down chronic sponge-munch trauma. I can, yes I can. Sully, I put the merest hint of powdered sugar on as decoration, so you'd be safe on that front. I'd even be willing to leave it off for you! Yep, with such a light and airy, as well as thin, cake, you would like the ratio of fruit and cream to cake. Swiss Rolls,now where do |I start? When I was a mere toddler, my Mum used to buy a Swiss Roll for us as to eat on Sunday afternoon. WE looked forward to a Swiss Roll every week. The first thing I ever learned in a cookery lesson at school at the age of, probably, six, was a Swiss Roll. It was something about rolling all that jam into the roll. We just loved making them. "How do you make a Swiss roll?" "You push him down a hill!" If that doesn't get your party going Jean, nothing will. ha! Ha! Used to bake cake rolls weekly...love the stuff..tender, light and addictive! Yours looks sensational with berries. I've already pinned the recipe. I simply have to make this elegant dessert. I recently used a sponge cake recipe as the basis for my cannoli cake. That recipe does like you suggest -- beating the egg yolks and egg whites separately. The cake made this way is so light. I love the beautiful raspberries on your roll. YUM!! Have a great weekend. Tony, I'll have to remember to do that! Or maybe I'll let Mr Delightful have that honour! I think you're right, Angie. I could definitely get addicted to this - weekly does not sound too frequent to me! Marisa, thank you! I know you're going to like it. This looks so yummy and is absolutely gorgeous! Great tips to avoid cracking! Cassie, thank you! I like that it looks "fancy" without all the bother of smoothly icing and decorating a layer cake. Martha, *of course* you still ate it! :D Isn't it fun figuring out ways to hide our mistakes! Pauline, that is hilarious (aside from the digestive consequences to poor Brandy, of course)! 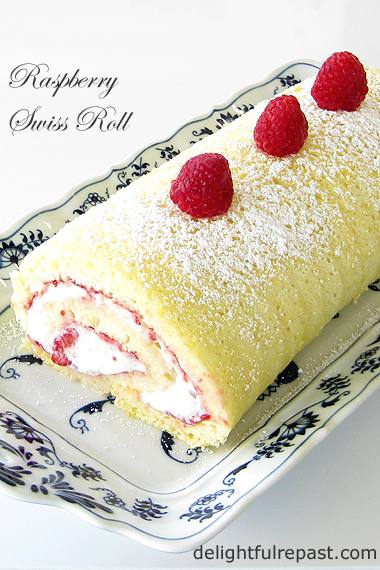 I would never have thought to make a Swiss roll for visiting canines! I found your post on Blogger's Pit Stop. Some great tips and a lovely recipe. Thank you, Robbie! I love giving baking and cooking tips to make recipes easier! Think twice, roll once - makes perfect sense to me. Thanks, Mrs Shoes. You're so funny! Why didn't I think of that? Let the good times roll with your yummy dessert! Thanks, Margie. But people are going to think you're from NOLA saying that! David, I knoooooww! That is such a pain! Looking forward to your report. I love Swiss rolls and thank you for all those good tips. I hope to make it soon. Thanks, Gerlinde! Let me know how it turns out for you. Yum! That looks and sounds tasty :) Thank you Jean for attending the #WednesdayAIMLinkParty. I shared your post. Thanks, Grammy Dee! AND thank you for your SM shares! Jean- you always provide the best tips! Thank you! Thanks, Sue! I want everyone who tries one of my recipes to get the best possible results. Marilyn, thank you so much! I'll be back! YUM! Looks tasty and I know it is. Thank you Jean for linking up at the #BloggingGrandmothersLinkParty. I shared this post. Thanks, Grammy Dee! Wish I had a piece of it right this minute! Thank you so much for sharing on your social media. Great tips, Jean. Thank you so much for sharing at: #BloggingGrandmothersLinkParty ! Now that's a work of art for all of the senses! Thanks for linking up at #BloggingGrandmothersLinkParty. I've shared your post on social media. Donna, thank you! You all are wonderful hostesses! Christie, thank you so much! And your social media shares are much appreciated. I'm coming right over, Jean, save me a slice! Okay, Amalia, I'm putting the kettle on now! I've tried a few sponge cakes recently and I'm beginning to really like them. Almost too much as a matter of fact!!! They are much easier to work with than a traditional butter-based cake and that makes handling them a dream. I look forward to trying your recipe and your pictures are great. Sandra, thank you so much! Do let me know how it turns out for you. I've never had it crack yet! I must admit, I've never made a rolled cake dessert before. Sad, but true! This one certainly looks delicious and I think it would be a hit around my house. Oh my!!!! This looks wonderful! Thank you for linking up at the #BloggingGrandmothersLinkParty. I shared this post. Thanks, Lori! Love the party! Thank you, aginglike ...! This is definitely the one for you then. You won't have any trouble rolling it. Clearissa, thank you AND thank you for sharing the post! Looks delicious! Thanks for sharing your recipe with us at #BloggingGrandmothersLinkParty. I'm sharing on social media. have a fabulous week! What a beautiful (and yummy) rolled cake, Jean! Thank you, Michelle! It's just about my favorite cake! Sue, thank you. And your social media shares are soooo appreciated! This is so pretty -- like a work of art. And, I bet it tastes absolutely delicious. Thank you for linking up at #BloggingGrandmothersLinkParty. I'm sharing your post on social media. Carol, thank you AND for the much appreciated SM shares! 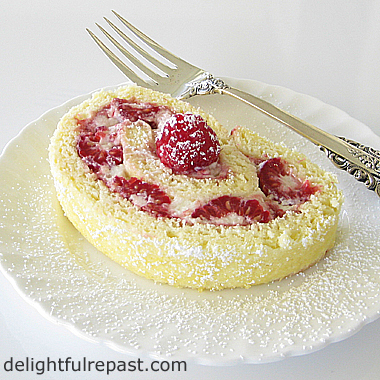 Oh my goodness, How in the world did I miss this fabulous raspberry cake roll??? I want a slice of it right now, Jean! Thank you, Kitty! It's one of those wonderful things that looks fancy but is really quite easy! I have never tried to make a cake in a jelly roll pan, your combination of cake and the raspberries sounds so delightful, light and fresh! Thank you so much for sharing at Celebrate Your Story! Thanks so much, Chloe! It was fun! What a beautiful dessert. And my husband loves anything with raspberries. I haven't made a "roll" in years! Pinning! Thank you, Cathy! If he likes raspberries, he would love this cake - fresh raspberries *and* raspberry jam.